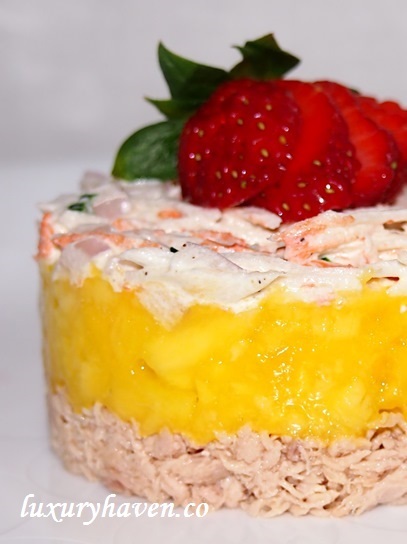 Here’s a visually stunning appetizer filled with tasty shredded crabmeat, tangy mangoes, & healthy tuna flakes; a seductive salad out to entice your guests! 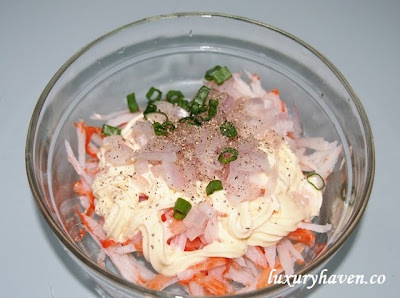 Mix crabsticks with chopped onion & spring onions, mayo & pepper. 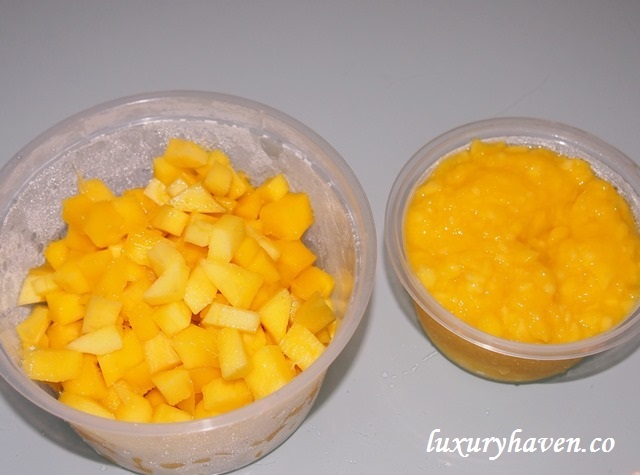 Wash mangoes. Remove skins & rinse again. Dice 1 mango, & puree the other. Place appetizer ring on serving plate. 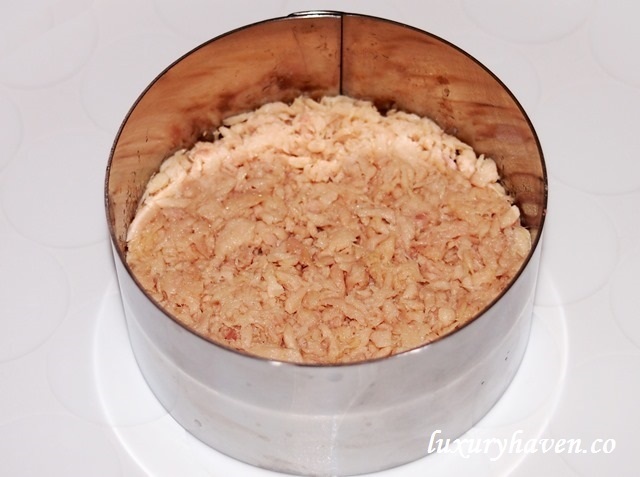 Fill the first layer with tuna. Gently pressed it down with the back of a spoon. 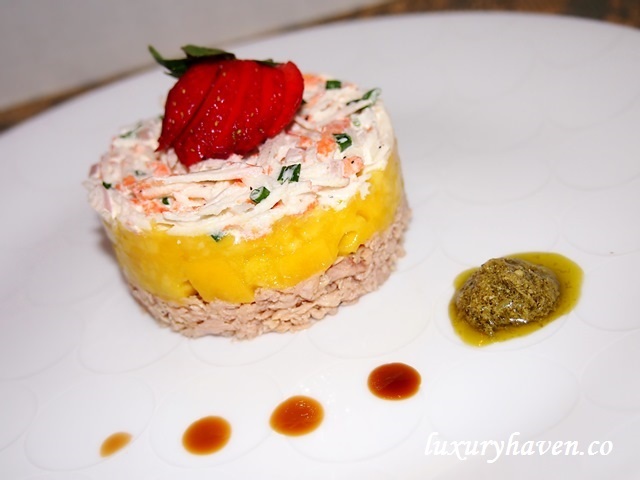 Mix dice mangoes with puree, & place on top of tuna. Pressed it down gently. 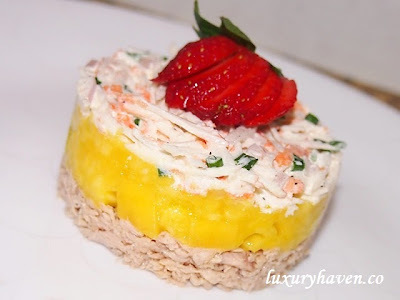 Top with crabmeat mixture & decorate with strawberry. 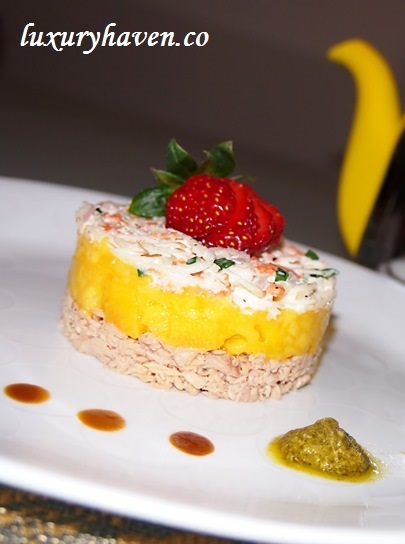 This Fruity Seafood Salad is perfect with a cup of Gryphon Tea, freshly brewed in the Degrenne Paris Salam Teapot! The #SalamTeapot, an iconic product from Degrenne Paris SEA now comes in new colours. 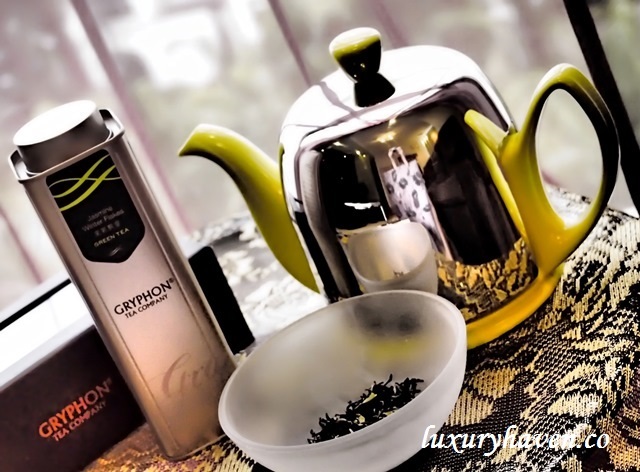 Enjoy a FREE tin of Grand Cru collection from #GryphonTea Company when you purchase a Salam Teapot. *While stocks last! 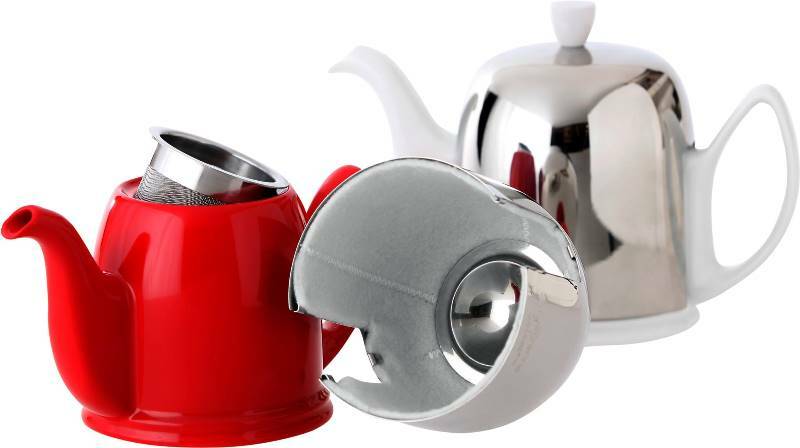 The Salam Teapot ‘s stainless steel dome has an inner-felt lining, keeping the tea warm for twice as long as a typical teapot, approximately 2 hours. #DegrenneParis, a French manufacturer & designer of tableware, retails exclusively at iwannagohome! 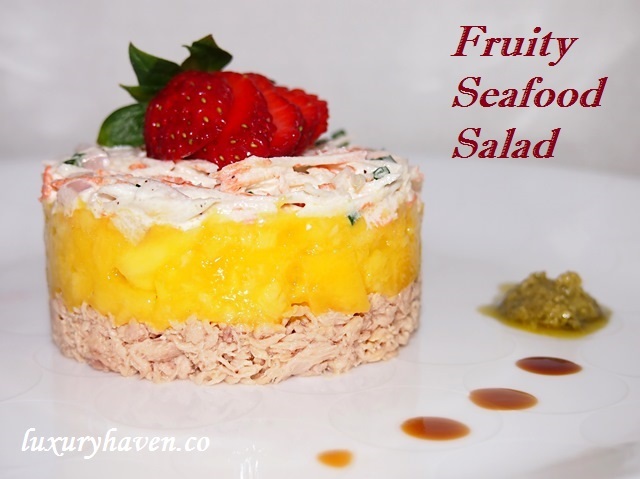 Entice your guest now with this delicious Fruity Seafood Salad pairing! Ken, you're super fast to arrive at my post today! Thks & have a good week! Lee Liet, I've gotten quite a handful of requests thru the years but no time to get to it. Thks for the sweet note & it's great having you here! Hope to see more of you :) Another giveaway is coming up, so stay tuned! 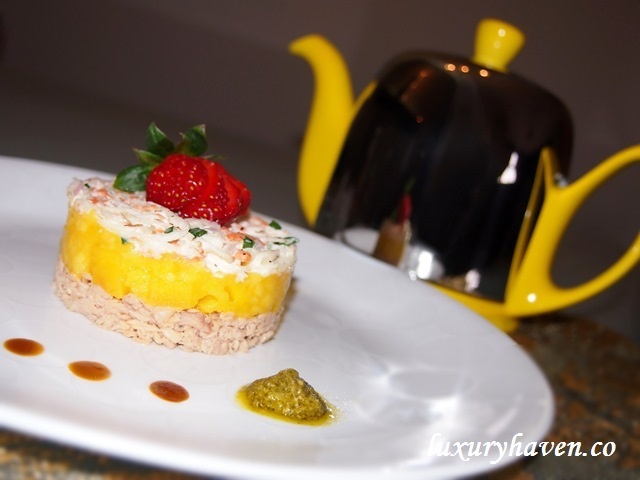 Purchase a Salam Teapot with Free SHIRLEY's Fruity Seafood Salad(specially made by Shirley)HAHA.. lol..
Nice post !! Have a Great Week ahead! EH, hahaha! You're so adorable! Thks again for being so supportive & you have a lovely week too! Simply stunning and love it so much. Also all the ingredients has infused a beautiful color and great flavors. Nava, thks so much for the sweet note! Bon Appetit! LuPorTi, thks dear! Good to have you back! Haha yea. I have just finished my busy period of my job. WOW! The salad looks lovely and the pairing of the ingredients is simply awesome. great post! easyfoodsmith, been a while since I last heard from you! Happy cooking! Great recipe with a great teapot! Just can't get enough of how you present your foods. So appetizing and so appealing, certainly make one crave for more. The teapot have a inner strainer for the tea leaves and this certainly make the tea nicer too. Such exotic-looking food on that plate! And love those teapots! Hi Shirley! 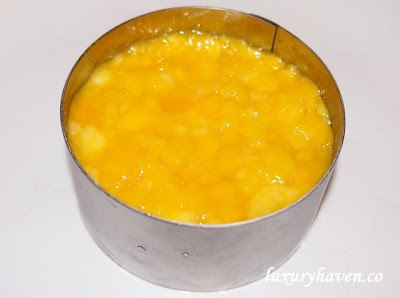 I thought it was a mango or some fruit cake from the mini thumbnail pic linking to this post from my blog. Looks good!! yummy! I wanna eat! 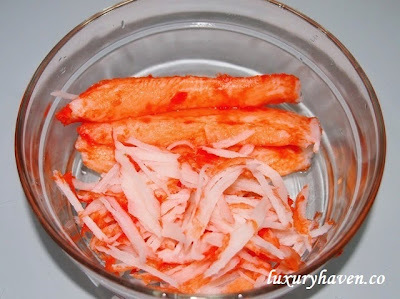 Wow Shirley this looks so good, I love fruit with seafood. Beautiful presentation. Juliana, thks for your sweet note! You have a lovely week too! That's a lovely and posh dish. I m sure you are a very meticulous person from the way you assembled and present it. Good job, Shirley! Amelia, thks! Means a lot coming from you, dear! wow..this is awesome..at first i thought that this is a jelly dessert. this is soo neatly done. Pepper, that's very kind of you! They're happy so far. Heehee! Wow!!! It's so beautiful like a pretty neat looking cake! After staring at the shrimps, I salivated. I was not wrong to say that you are very creative and innovative in almost everything.